Sue Neill Fraser – why should we listen to Dr Bob Moles? Tasmanian MPs have been invited to attend a special Parliamentary briefing (August 19, 2014) by Adelaide based law expert Dr Bob Moles, canvassing the errors and flaws Dr Moles has identified in relation to the (arguably unsafe) murder conviction of Sue Neill Fraser, who is serving 23 years in Risdon prison for the 2009 murder of her partner Bob Chappell, whose body has never been found. It’s a matter of great public interest and controversy and the briefing is a rare opportunity to hear from Australia’s pre-eminent legal academic on the subject of miscarriages of justice. Here, Dr Moles responds to remarks and questions that are not uncommon from people who are comforted by the (optimistic but unrealistic) assumption that the legal system in Tasmania always gets it right and who sincerely believe that Neill Fraser was found guilty beyond reasonable doubt in a fair trial. An outsider coming in will simply have formed a position on the information he has researched and been fed and without the vital knowledge gleaned from having observed witnesses and other visual experiences that can only be gained from being a part of the case. If this position were to be applied generally, there would be no appeals in the criminal justice system. I am approaching the matter in exactly the same way that the court of appeal would do. By examining the transcript of the trial and evaluating it in the light of the relevant legal principles. I am not an “outsider”, I am an Australian citizen who has studied such cases over the last 15 years and written Australia’s leading text book on the topic. The foreword to the book was written by Michael Kirby (former justice of the High Court of Australia) and judges of the Ontario Court of Appeal and the Canadian Supreme Court have referred to me as an “eminent expert” on the topic. I do not accept that all of the people involved, including… civilian witnesses, police, forensic experts, the Office of the DPP, courts, judges, juries, appeal courts and probably a raft of others got it so wrong. Regrettably, this is what has happened. It also happened in the case of Lindy Chamberlain (NT) and Edward Splatt (SA). After each Royal Commission, it was determined that every single piece of forensic evidence in both cases contained significant and serious errors. Similar pervasive and systemic error occurred in the case of Graham Stafford (Q’ld), Andrew Mallard (WA), Gordon Wood and Jeffrey Gilham (NSW). We are about to confront a range of cases involving serious systemic error in SA. While I have not minutely addressed the case a matter that has been discussed a lot are the untruths ( described also as lies ) told by the offender and never satisfactorily explained. In the appeal in Wood v R, the Chief Justice said that some of the explanations given by Wood were inconsistent and some were lies. However, he said, that could not possibly be said to establish a motive for murder. In such situations, it is understandable if people suffering serious loss are confused, and sometimes they say things which are not true in an attempt to protect others or themselves from embarrassment. Clearly a person cannot be convicted of murder because they told a lie. There has to be clear and compelling evidence of an unlawful death, and also compelling evidence that the accused is guilty. This means, in a circumstantial case, there should not be any other rational explanation of the circumstances consistent with the innocence of the accused. We think “miscarriages of justice” also occur in situations where people who are guilty of crimes are not brought to account. We have published some account of these in our book A State of Injustice. As for the possibility of innocent people being in jail, there shouldn’t be any at all. 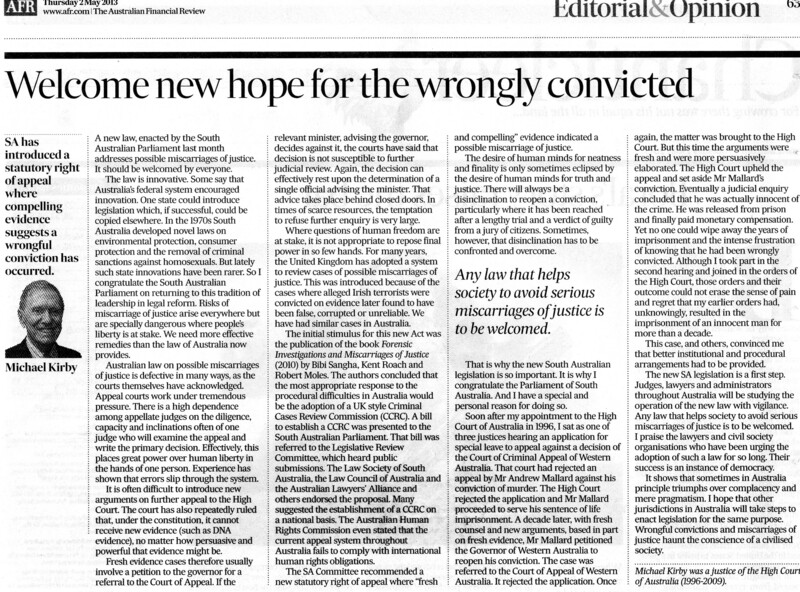 Lord Igor Judge, Lord Chief Justice of England and Wales said at a conference I attended in Sydney quite recently that any wrongful conviction represents a catastrophic failure of the legal system. In the UK over 360 convictions have been overturned (including 100 murder convictions) over the last 15 years – each of which had involved an unsuccessful appeal (a condition for applying to the CCRC). The US Innocence Projects have also led to the overturning of around 350 convictions. Most independent analyses regard the figure of 1% as a conservative estimate of wrongful convictions. This means that there would be some 300 wrongful convictions in Australia. I have great faith in our jury system. So do I. However, the simple fact is that if the jury is given wrong information they will come to wrong conclusions. In none of the cases which I have studied would I blame the jury. I cannot be convinced that this case went so horribly wrong. Perhaps it would be appropriate to hear the information which is available about the errors which occurred at this trial, before reaching such a conclusion. The only time I would be interested in attending a session such as the one you have organized, is if there was some balance and fairness brought to it by the inclusion of an eminently qualified person to put the other side. I am not arguing for any “side”. I am putting forward a careful analysis of what happened at trial, based upon the trial transcript. In doing so I set out the relevant legal rules which apply, and which I have published in my text book on the issue – Forensic Investigations and Miscarriages of Justice (Irwin Law, Toronto, 2010). You can easily check my references to the transcript – the relevant legal rules are not contentious in any way, and I can provide links to the law reports which I cite. Any sensible person can then apply the rules to the situation and appreciate that error has occurred. As just noted, everything I say is footnoted and can be checked. I only deal with factually based evidence. That is what the court in this case should have done too, but regrettably failed in this case. I do not deal with any of these things. I always work from original documents. Your evidence needs to stand the similar level of ‘ testing’ to that of evidence supporting or showing guilt. We have worked to a much higher standard than did the court in this case. Many people think it highly unlikely that the criminal appeal system in Tasmania could be in breach of international human rights obligations. However, I managed to persuade the Australian Human Rights Commission that it was so, and they stated this to be the case in their submission to the Australian Legislative Review Committee [see para 2.6]. The appeal system has been in breach of these provisions for over thirty years. I was the first person to realise this and to bring it to the attention of the relevant authorities. My arguments to the LRC in turn managed to persuade them that there was need to reform the criminal appeal system. The LRC recommended the enactment of a new statutory right of appeal. The Attorney-General and the Government of South Australia agreed. So too did the opposition and independent MPs and MLCs. The legislation, parliamentary and media statements are available here. Indeed, the legislation passed in the parliament without a single dissenting voice. The shadow Attorney-General was on the LRC. It was the first substantial change to the statutory appeal rights in Australia in 100 years. Those appeal rights had been in “common form” throughout that time. Now there is an inconsistency in the appeal rights between Tasmania and South Australia which undermines the principle of equality before the law which is part of international human rights and the “rule of law” principles which Australia takes to be important. We have set out the details of these obligations in the articles referred to below. My role as an academic lawyer and educator is to provide reliable and factual information about the way in which the legal system works. This includes analyses of the ways in which it sometimes fails to work properly. If I were an architect or an engineer, I would study the collapse of bridges and buildings to ensure cognisable and avoidable error is not repeated. Unlike a practicing lawyer, I have no particular obligation to any client. My only obligation is to ensure that the legal system works properly. I provide impartial, balanced and objective information about the legal system. My critical analyses have been published in books and articles, the most recent and relevant of which include the Criminal Law Journal, the University of New South Wales Law Journal, the Flinders University Law Journal 2012 and the Flinders University Law Journal 2014. The Hon Michael Kirby publicly expressed his support for our work in the Australia Financial Review 2013.